Do you enjoy feeding and watching our most beautiful birds the ruby-throated hummingbird? I have been reading a book with my book club titled The Fastest Things on Wings by Terry Masear. She is a Hollywood-based wildlife rehabilitator who works only with hummingbirds. In her fifteen-year career as a hummingbird rehabber, rescuing thousands of hummingbirds, she has learned much about these fascinating birds, but admits that she will probably never learn all they have to teach her. Maseur weaves the book around the remarkable story of Gabriel, a male Anna’s hummingbird. She explains, “Gabriel’s rehabilitation during the long summer of 2008 offered a powerful lesson on the trials and triumphs of rescuing hummingbirds in a bustling urban environment”. It is remarkable to know that of the sixteen species of hummingbirds breeding in North America, eight species are found in the Hollywood and Los Angeles area. They are a relatively new phenomenon there. When my husband and I lived in the Los Angeles suburbs in 1968-70, we saw no hummingbirds at all. Rehabbers started receiving rescued hummingbirds in the early 1970’s. The birds have been encouraged and supported by the gardens of residents who are growing pollinator friendly plants. Most California hummingbirds winter in Mexico, but with warming temperatures, some are beginning to winter in southern California. Hummingbirds have to eat every thirty minutes during the day in order to support their high metabolism. When hovering, hummingbirds beat their wings more than fifty times per second. They cannot survive on sugar water or nectar alone, but need to eat insects as well. Breeding males only stay around for a day or two and move on to breed again. The female does all of the nest building, brooding and feeding of the young. The tiny nest is placed on a tree branch and made of stretchy spider silk and other soft materials. It is camouflaged by the placing of lichens all over the outside of the nest. The nest stretches as the young birds grow. On the east coast we have only one species of hummingbird, the ruby-throated. The ruby-throated hummingbird has an extensive breeding range encompassing the mid-west all the way to the eastern seaboard, and as far north as southern Canada; they are not seen in California. The ruby-throated is the northernmost breeding hummingbird, and winters in Central America. In late August or early September, ruby throats start their five hundred mile nonstop migration, often choosing the shortest route over the Gulf of Mexico, a dangerous overnight flight over open ocean. If the weather is fine most make it, but if a storm or a headwind blows up, many succumb to the ocean water. In the first week of May, ruby-throated hummingbirds arrive back north and show remarkable fidelity to their previous nesting site. They can easily find the feeder at your house where they ate last year. If you haven’t fed ruby-throated hummingbirds before, you will enjoy it. Mix up some sugar water with the following recipe: One part sugar to four parts water. Bring it to a boil to kill any bacteria or mold present. Cool and fill feeder. Extra sugar water may be stored in a refrigerator. Do not add red food coloring; its not good for any of us. 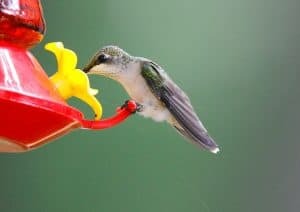 Put the sugar water in a hummingbird feeder, hang it on your deck or other location you can easily watch and enjoy. Change the water at least once a week, cleaning out the feeder thoroughly each time. In hot weather, you will need to change the sugar water more frequently as it can ferment or develop mold that is unhealthy for the birds. Many thanks to all flora and fauna reporters for the month of July. Please send reports by August 26 for inclusion in next month’s column. You can call me at 692-3907, e-mail me at mariancharman@gmail.com, or write me at 7A Old Colony Drive, Westford. Ginger Dries, Sherwood Drive. June 5, doe and fawn crossing Tadmuck Rd. June 22, two baby raccoons on Stony Brook Rd., no sign of parents. June 25-26, mama turkey around. We are overrun with blackbirds eating the suet I put out every day. Too many gray squirrels getting over the baffles. Family of groundhogs, three babies and parents, and rabbits have eaten the garden. Hot sauce spray doesn’t deter them. Two families of house wrens in boxes, and all the regulars at the feeders. Dot Mooney, Monadnock Dr. June 25, lovely day. Along back lawn daisies, daisy fleabane and fragrant common milkweed in bloom Early evening, a titmouse took an extended bath in deck bird bath, thoroughly enjoying himself. June 26, at Howard Rd. wetland, heard common yellowthroat, warbling vireo and several red-winged blackbirds, several large bullfrogs, numerous large and small blue dragonflies darting above water. Blooming nearby, blue toadflax, white yarrow, purple bittersweet nightshade and common St. Johnswort. Branches of white swamp azalea hung over the road, and their pungent scent was amazing. Along roadsides, birdsfoot trefoil in bloom. June 27, sat on the front step to watch feeder for awhile. Chipping sparrow, female red-bellied woodpecker. House sparrow, white-breasted nuthatch joined them, upside down. Chickadee, then a flashy male rose-breasted grosbeak with a male house finch joining him, then a male red-bellied woodpecker. Our resident tom turkey came along, scaring a dove away. The buff-colored squirrel in and out. A lovely color but still a pesty squirrel, blue jay having a snack, very quiet. Several birds and one squirrel making warning calls. Hawk around? I looked all around and there, sitting on the edge of a garage roof is the young red-tailed hawk. A beautiful young bird. Denali Delmar, at Lakeside Meadows. June 29, bluebird seen on the sidewalk. Marian/Bill Harman, Old Colony Dr. June 29, fireflies seen around condo. Leslie Thomas, Old Colony Dr. June 27, female turkey seen, goldfinches and cardinal at feeder. Many very smart squirrels, and a woodchuck. June 29, beautiful big tan colored doe eating leaves right by the deck. I think she was pregnant. Leslie Thomas, Old Colony Dr. July 6, hummingbird at my million bells plant. Marian/Bill Harman, Old Colony Dr. July 8, two turkeys here, cardinal, jay, two grackles, red-winged blackbirds, titmouse family, crow family, cicadas heard, goldfinches, chickadee, pair of red-winged woodpeckers, downy woodpecker juvenile. July 11, young crow walking on lawn and trying things to eat. July 22, two female turkeys walking by. July 24, pileated woodpecker seen and heard at Randolph Circle. July 26, hummingbird at basil flowers and petunias. Two female turkeys in front. Dot Mooney, Monadnock Dr. July 9, red-bellied woodpecker fledgling on black oil feeder awkwardly but successfully getting the seeds. The baby has so little coloration on its head I could not tell if a boy or girl. Father joined baby and they flew off together. A chickadee in birdbath on front step. A very popular place, perhaps because it is surrounded by potted flowers, sort of private. The sumacs along back lawn are slowly changing color, the shades headed toward what will be rich red, becomes a very popular place for birds in winter. Ginger Dries, Sherwood Dr. July 9, an adult raccoon with two babies came through the yard at 8:30 pm eating under the feeder and drinking from bird bath. The two babies scurried under the lilies and hostas when I came out. This is the first time I have seen them–really cute. One mama turkey visits every day. Wren babies have left the front house after their second nesting. It was fun to see them being fed daily. Too many blackbirds, jays and squirrels which get over the baffle and destroy the suet and seed in a minute. Hummers were here a lot then disappeared. I have changed the food three times, but they haven’t come back. Cardinals, finches, mourning doves, chickadees, titmice, three kinds of woodpeckers, nuthatches, sparrows and big rabbit families. Doug Pederson, at Forge Pond. June 27, mallards, cross-breed ducks (mallards with white Pekin? ), ten baby wood ducks with mom, three baby swans. Roberta McGuire, Chamberlain Rd. June 27, I noticed a beetle feeding on the flowers of the butterfly weed….I think it is a milk weed leaf bug. Flower bloom seems accelerated this year. Rosemarie Koester, Providence Rd. July report: Pair of cardinals, blue jays with young, grackles with young, many red-winged blackbirds with young, a few chickadees, tufted titmouse, nuthatch, rose-breasted grosbeak pair, house finch pairs, a few goldfinches, robin, hawk overhead, ruby-throated hummingbirds male and female, flicker, a few turkeys. A first for me– a yellow-belled sapsucker female. “During the very hot first week of July, we put out fresh water every day, sometimes twice, even put ice cubes in to keep it cooler for a longer period. Saw many birds drink and bathe in it. Squirrels and chipmunks also climbed up for a drink.” Also, gray squirrels, one red squirrel, many chipmunks making many holes in yard, several bunnies, butterflies and bees. Marian Harman is a member of the Westford Conservation Trust, a non-profit conservation organization whose purpose is the preservation of Westford’s open spaces and trails. The Trust welcomes new members and volunteers. Check out our web page at westfordconservationtrust.org, or visit us on Facebook.